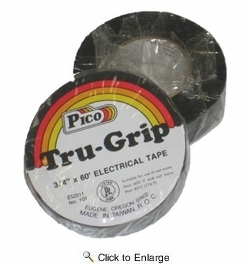 Tru-grip all weather black vinyl tape, UL approved for use at not more than 80�C (176�F). High quality imported tape made of soft polyvinyl 7 mils thick, 3/4" wide in 60' lengths. Excellent adhesive qualities in all types of weather. Each roll is labeled and individually wrapped.